The UU journal contains words and images that connect children and youth with their Unitarian Universalist heritage (including the principles and sources) as well as wisdom from other world religions and the earth. With the use of these prompts, children explore and meditate visually, through doodling. How to use the journal in class and church: why not replace activity bags and pipe cleaners with a resource that supports the development of our youth's UU identity while calming and centering them on a much deeper level? Keep the journals and a supply of good pens at church for use during Sunday services, religious education classes, Coming of Age program, and youth group. At the end of the church year each child will have created a beautiful visual record of their journey and a memento of their faith community to take home and keep. Gallery of “doodled” pages. 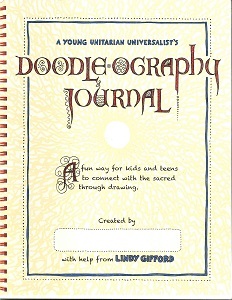 What Doodle-ography can do: the journal can be used to encourage quiet contemplation and it has also been used very successfully as a support for attentive listening during story times and Sunday services. Recent research demonstrates that doodling actually improves retention of auditory information. Doodling has also proven a very effective aid to increasing focus for children who struggle with attention and anxiety issues. Each journal contains tips for getting started.